Sign up and receive Property Email Alerts of Buildings for sale in Columbine, St Helena Bay. POPULAR SELF CATERING COTTAGES For Sale in St Helena Bay - Own Your Dream Business! Ever thought of leaving big city life behind - and you have a passion for the hospitality industry? This could be the ideal opportunity to purchase well established and popular holiday cottages, producing an income from day one. This property with an 180-degree view overlooking the ocean is situated in the beautiful Cape West Coast Village of St Helena Bay. * Four 2 bedroom, 1 bathroom cottages, each with its own fully equipped kitchenette, lounge area and patio with built-in braai facilities. The layouts are identical. * Poolside is a secluded 1 bedroom en-suite cottage also with fully equipped kitchenette and lounge. 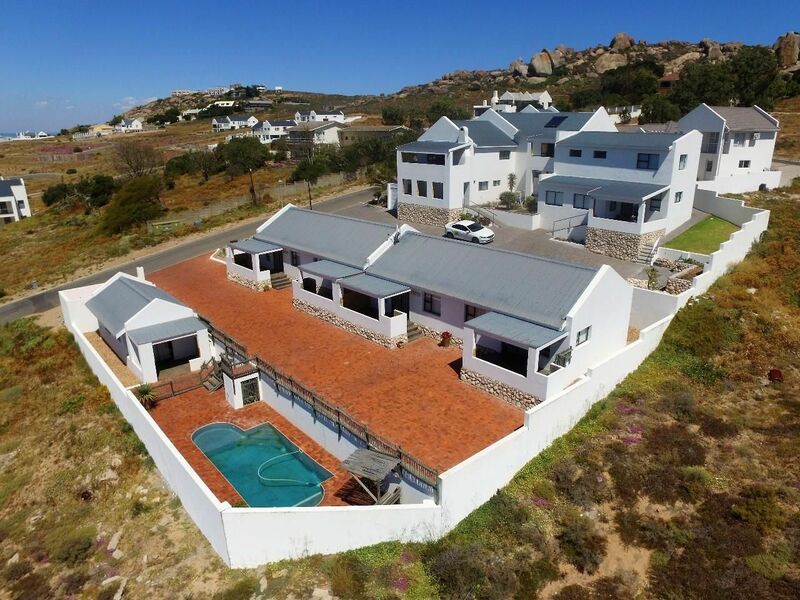 The cottages are fully equipped, is ready to generate income and is available to a buyer looking for life on the Cape West Coast surrounded by the most amazing ocean and distant mountain views - which will remain uninterrupted due to its elevated position on a hillside. Guests will have the opportunity to watch the fishing boats go about their business and also regularly spot the dolphins and whales when they visit the bay, from the lounges and patios of the cottages. Pop down to the nearby harbour and select your catch of the day as it comes off the boats. Nearby amenities include good restaurants, a golf course and spa as well as a Spar for everyday shopping. The property is well maintained, is professionally presented and consists of serviceable furnishings, decor and is fully stocked with kitchen appliances, linen, TV, DSTV etc. The asking price is very reasonable, considering the location of the property, and the fact that all the furniture, appliances, fittings, and linen is included in the sale as is the existing website and booking agent agreements. All the necessary consents and local authority approvals are in place to conduct business as a self catering establishment. You will just walk in and trade! If you want to make a lifestyle change, thinking of relocating to the beautiful Cape West Coast, and have always dreamt of operating your own business, this might just be your opportunity! Viewing is strictly by appointment as guests are in residence. Sign-up and receive Property Email Alerts of Buildings for sale in Columbine, St Helena Bay.